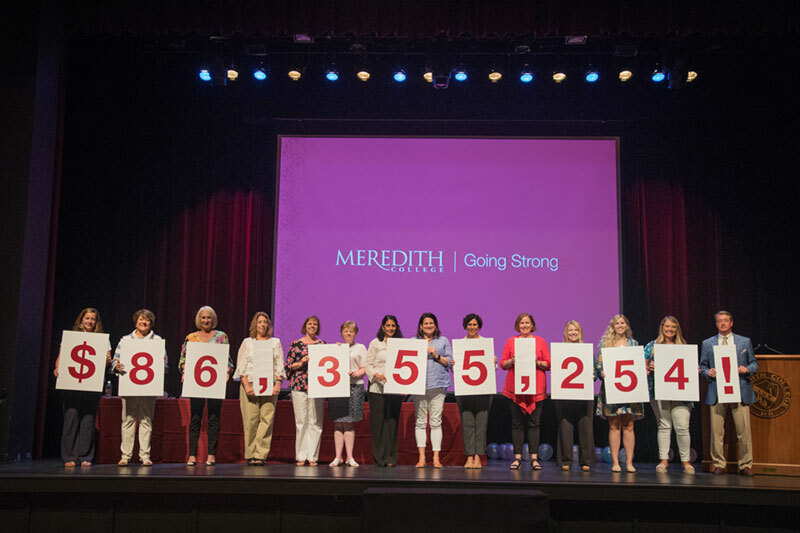 President Jo Allen announced during her 2018 State of the College address to the campus community on August 13 that Beyond Strong | The Campaign for Meredith has raised $86,355,254 since the Campaign began on July 1, 2012. The Campaign has surpassed its $75 million goal by $11 million to date and more than doubled the total raised by the last campaign. The College endowment in 2012 was $75 million. It has now grown to $111 million. The endowment is important because it enables the College to offer more scholarships and financial aid, which helps with recruitment and retention of students. There have also been 31 gifts of $1 million or more and 330 major gifts of $25,000 or more. Planned giving during the campaign is currently at $37 million, creating a future pipeline for the College. Giving by current and former faculty and staff also continues to grow each year with 73.2% giving in 2017-18. Campus support shows the external audience that belief in the College is strong. The Meredith Fund raised $2,318,009 in the last fiscal year, which is an increase of 10% from the previous year and the highest ever. Make It Count for Meredith Giving Day in February raised $392,811 and the Parents Fund raised $83,000 for a security project. Beyond Strong | The Campaign for Meredith will continue to support the six pillars in the strategic plan through December 31. Watch the faculty and staff campaign number reveal on YouTube.